In this exclusive construction video tutorial, the renowned engineer S.L. 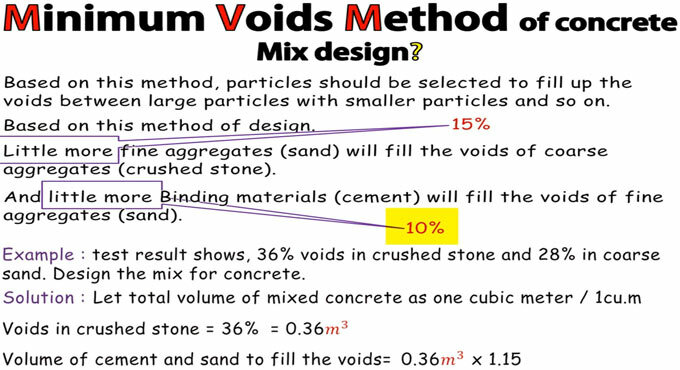 Khan briefly explains the minimum voids method in concrete mix design. The sand quantity that is utilized should be maintained in such a manner so that it can entirely fill the voids of coarse aggregate. In the same way, the quantity of cement that is utilized should remain in such a manner so that it can fill the voids of sand as well as a dense mix with the minimum voids is produced. Practically, the quantity of fine aggregate utilized in the mix is approximately 10% above the voids in the coarse aggregate and the quantity of cement is sustained as about 15% over the voids in the fine aggregate or sand. Adequate water is included to the resultant mix of cement, sand and coarse aggregate so that the concrete mix can function properly. But this method can’t provide accurate result since the existence of cement, sand and water detach the components of the course aggregate, thus raise its voids which are decided earlier without sand and cement. Likewise, the voids of sand are raised because of the inclusion of cement and water. Therefore, a dense concrete is not always formed and similarly the grading of aggregates is not performed in order to involve least amount of water (and hence least w/c ratio) that can bring superior strength. The above information provides the basic concept of minimum voids method. Problem : From the test result, it is found that 36% voids in crushed stone and 28% in course sand. Based on this data, design the mix for concrete. To learn the solution method, go through the following video tutorial.